The Dance Academy of Being© and the section C.I.D Avignon - France invite all professional dancers, amateurs, lovers of dance and nature to join us. Through dance we offer our love to Mother Earth ! 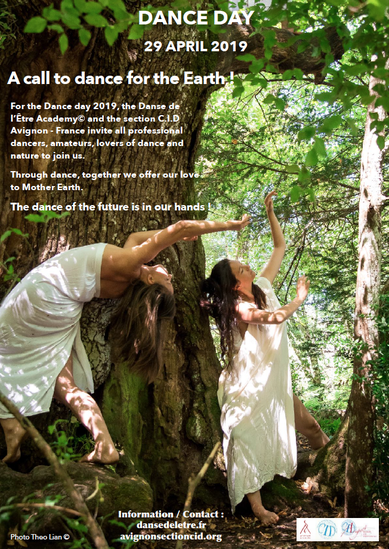 2 Connect with all the dancers who dance for Mother Earth on this Dance Day to create a web of love and healing. 4 Post to all your social mediaand send us, we will post to ours for the Dance day. Dance has always been a way of connecting to the Earth and the cosmos. More and more of us realisethat our land is our mother, Gaia. What we do to her it is what we do to ourselves. We are the"guardians of the earth" and through dance we can make a concrete act to heal Mother Earth. The more of us there are for the "Dance day 2019" to connect and dance for the Earth, the more we will create a collective event, able to do miracles by the power of our thoughts connected with our body and hearts. Thank you to spread as much as you can in your network. The Dance of the Future is in our hands !